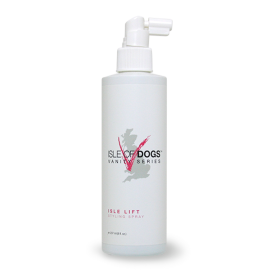 Isle Lift is a non-aerosol, protein-rich spray that gives structure at the root to achieve extra height and volume. The directional applicator delivers maximum lift so that the coat stands up and away from the body. Works great for overall lift and volume, but can also be targeted to areas such as head furnishings and eyebrows. Purified water, SD Alcohol, PVP/VA Copolymer, PVP, PEG-40 Hydrogenated Castor oil, Panthenol, Coconut oil, Sweet Almond Oil, Dimethicone Copolyol, Citrimonium chloride, Fragrance. Directing the applicator tip into the desired area, spray into the roots or undercoat, and blow dry or style. Can also be sprayed onto fingertips and worked into head or leg furnishings.